In 2017, we renewed our Religious Education / Faith Formation classes from individual youth classes to Family Faith Formation. We chose Sophia Institute Press as our primary resource for family catechesis, but made adaptations as needed. 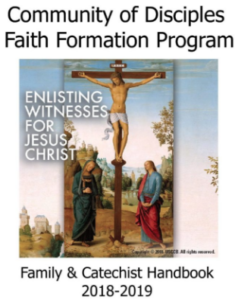 Family Faith Formation supports and encourages living as missionary disciples through a monthly parent meeting, a monthly family Mass, and a monthly community meeting. The parent meeting is a gathering of the entire family at the start of each month. After a group prayer, the adults meet for an overview of that month’s religious theme as well as group discussion. The youth (Kindergarten – 12th grade) engage in activities that are meant to complement the religious theme they will study at home with their families. The monthly family Mass on Wednesday nights allows for worship, a family-centered homily, and family-led ministries. Community meetings are a time for families to come together for an outreach, service project or a celebratory event. The entire parish is invited to join the faith formation families. All are welcome!